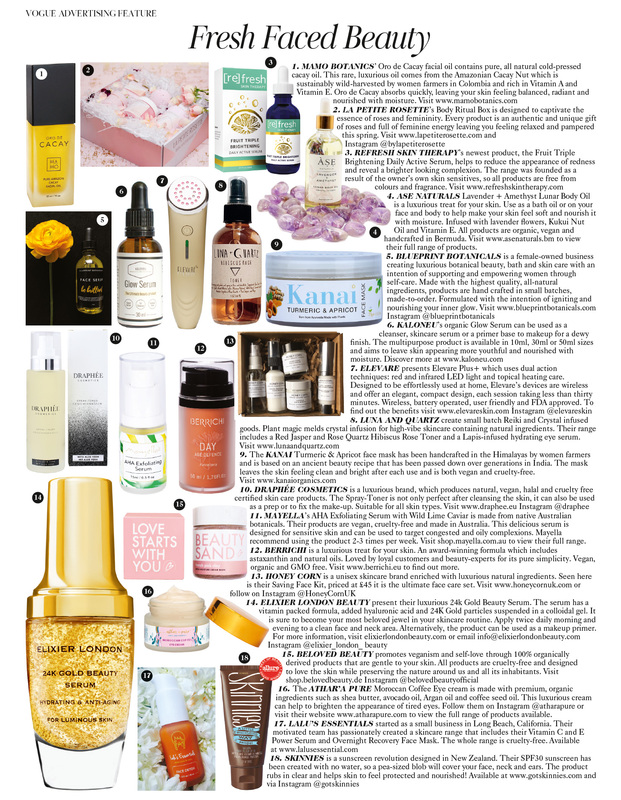 vitamin rich cold pressed rosehip to achieve a radiant healthy glow. Enhanced with the active benefits of native botanicals and aromatherapy pure essential oils, Mayella ® AHA Exfoliating Serum has been formulated containing certified organic and bio-active ingredients. A vegan, plantbased daily exfoliate that is suitable for all skin types, women, men and teens. To compliment the multi exfoliative action of active AHA’s, we have incorporated the pure aromatherapy benefits of organic essential oils with Australian Native extracts and the highly exfoliating native lime to clear away dead skin cells leaving your skin radiant. All the while offering intense hydration to new skin cells and with cold pressed rosehips for their nourishing vitamin rich profile. Mayella ® AHA Exfoliating Serum is an effective and nurturing daily exfoliate and an important step in achieving a clear, radiant and smooth, hydrated complexion. Alpha Hydroxy Acids (AHAs) are naturally occurring molecules that originate from various natural sources such as sugar cane (glycolic acid), apples (malic acid) and milk (lactic acid). The infamous Egyptian Queen Cleopatra used to bath in milk to maintain her youth and beauty, the lactic acids in the milk bath worked to hydrate her skin and refine away rough, dry and dead cells. A wise woman was Cleopatra, she certainly knew the secret to maintaining smooth radiant skin. We have captured this ancient wisdom with our Mayella ® AHA Exfoliating Serum & Lotion. In a specific layer of the epidermis our skin cells secrete a mixture of substances. Lipids (oils), cholesterol, free saturated fatty acids and ceramides (natural lipids or fats in the skin helping to maintain moisture amongst other things) all mix into a glue like form serving to hold the maturing cells together and making the epidermis an effective barrier resistant against external and foreign elements. The efficacy of this barrier is reflective of the health and integrity of our skin. A healthy radiant skin has an active program of certain enzymes breaking down this cohesion between the cells once they are fully mature in order for these cells to release from the skin’s surface. Our cells are “born” and progress from base layer to the surface over an average period of 4–6 weeks for adults. AHA’s are particularly perfect in the way they serve the skin to support the release of fully mature or dead skin cells from the surface by breaking down this glue and releasing the dried up and dead “horny” cells. We feel these sometimes as dry scaly patches. A build up of dead skin cells and old or rancid oils, will prevent our skin from absorbing nourishing serums and lotions effectively. One of the key secrets to maintaining youthful, glowing skin is to encourage new cell growth and healthy cell turn over through regular exfoliation. AHAs have been widely researched as to their benefits and have been one of the most exciting advances in skin care. While encouraging the release of dead, dry skin cells on the surface layers is supportive of a smooth radiant skin, the deeper dermal effects of AHAs have been shown to produce increased production of collagen and in levels of mucopolysaccharides which translates as increased moisture and hydration in the skin resulting in a dewy, hydrated, radiant appearance. 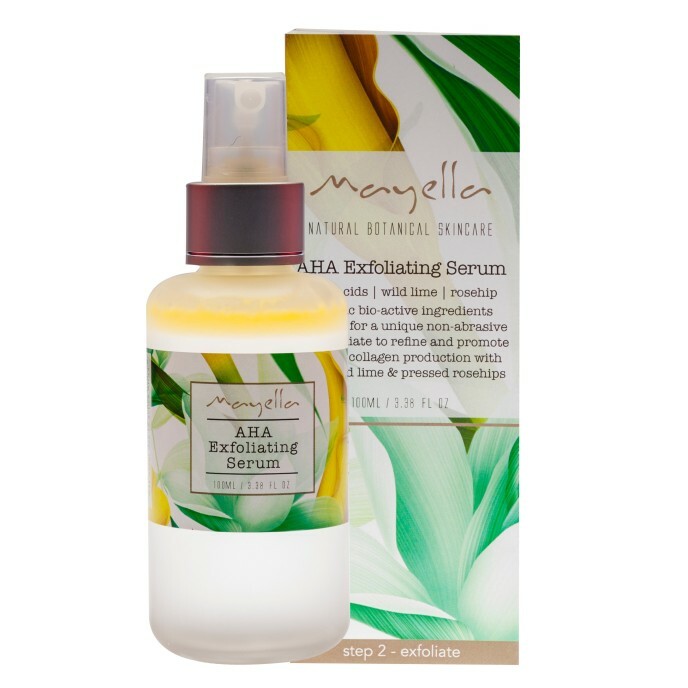 Mayella ® AHA Exfoliating Serum is a leave on serum. Perfect for use with skins struggling with congestion, a spot treatment with irregular break out, in conjunction with our Vitamin Serums and Lotions to aid in reducing pigmentation and in balancing oil flow or dryness. Shake bottle well and disperse 1–2 sprays of AHA exfoliating serum onto clean dry hands. Apply to your whole face pressing exfoliating serum gently into the skin and leave on. Some gentle tingling may be felt as the AHA’s absorb into the skin. If you wish to use your AHA exfoliating Serum as a spot treatment, disperse a single spray onto the palm of your hand and dab a small amount on those few pesky spots that threaten to break out. Apply as you feel the breakout threatening and definitely if the breakout has occurred. AHA’s will continue to exfoliate removing dead cells and improving skin texture ready for Step 3 – Vitamise.